So what makes an emerald precious? Its rarity is a bit part of why, as its beauty. Emeralds have long been both decorative and superstitious stones, despite high-quality examples being very difficult to come by. The emeralds (May Birthstones) that are exceptional are incredibly rare and fetch a price often equal to or in excess of a diamond of the same size and quality. You will hear the term “precious stone” used all the time when most people really mean “gemstone”. All precious stones are gemstones, but not all gemstones are precious stones. There are, in fact, only four precious stones, of which emerald is one, along with diamond, ruby, and sapphire. The rest are semi-precious. 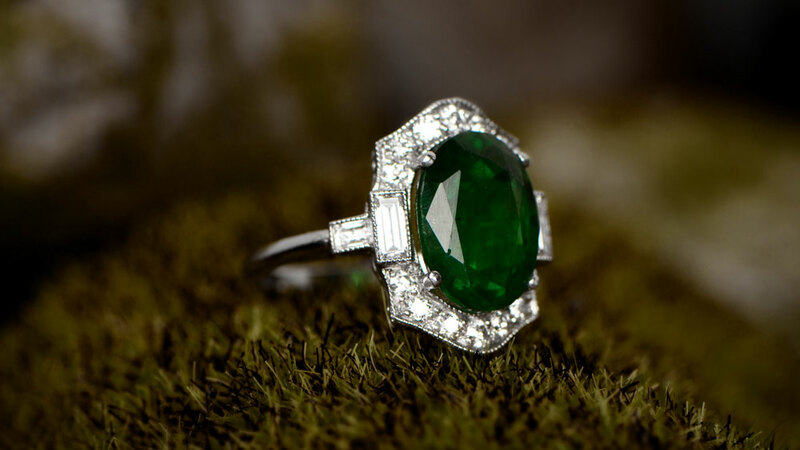 Click here to shop our collection of emerald engagement rings. Emerald stones probably have more myths and superstitions than any other gemstone. Two popular examples are that they bring happiness to a marriage and also act as an aphrodisiac. Is there a connection? Decide for yourself! According to legend, emerald cure epilepsy, snake bites, blindness, ulcers, poison and a ton of other stuff. It was also thought to protect fishermen from the perils of the sea. 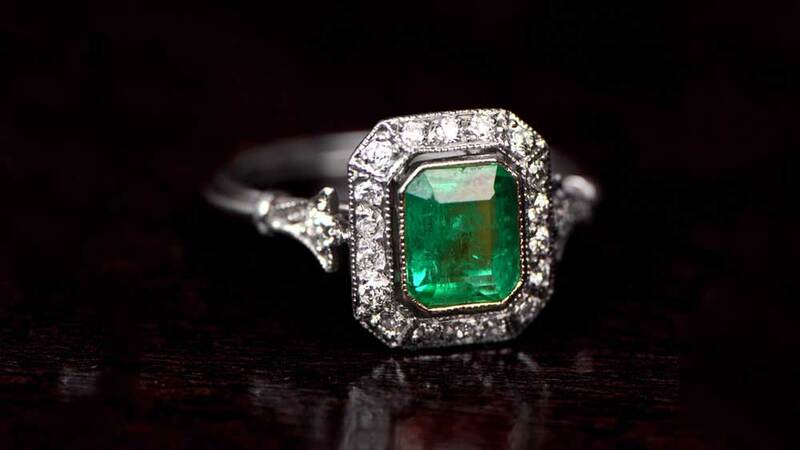 Emeralds mines have been around in Egypt for about 3,500 years, although most locations no longer produce stones. 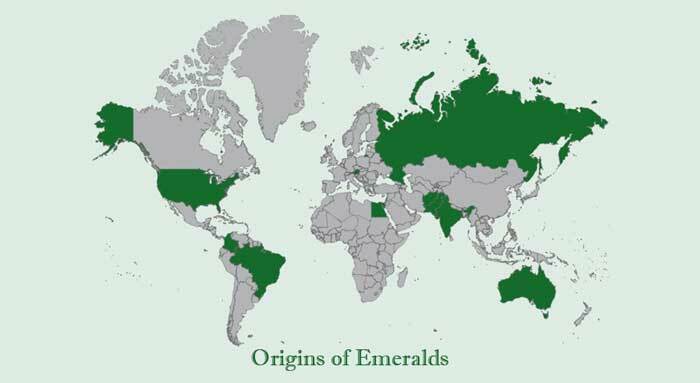 India and Austria have also been centers for emerald production for about 600 years. In more recent times, emerald deposits have appeared in many countries across the world, which is unusual for precious stones. Most deposits are very small, however, with few being workable for any length of time. Colombia is now the largest supplier, producing anything from 50% – 95% on an annual basis. In the US, there are emerald deposits of various sizes in Connecticut, Montana, Nevada and the Carolinas. The name emerald comes from a variant of the Ancient Greek word “smaragdus”, meaning “green gem”. The first Egyptian mines were at Mount Smaragdus and were heavily exploited by invading Roman and Islamic armies until only ruins remained. The crystals grow in veins of hydrothermal fluids which originate deep in the earth’s crust. As the veins cool, emerald crystals will grow assuming conditions and other factors all align. Several different processes have to occur at the right time to complete the formation of the crystals. It is this highly dependent, and unreliable, a sequence which makes for an emerald’s rarity. Emerald crystals take hundreds of millions of years to form. Due to the depth at which creation starts, the exact timeline is not certain. The crystals consist of the mineral Beryl, and their color is from traces of chromium and/or vanadium. Aquamarine is also an emerald by any other name, but contains traces of iron and occurs in much greater quantities. Emerald, despite a reasonable rating on the Mohs Hardness scale of 7.5-8, is still the softest of the 4 precious stones. Problems come with emerald stones being quite fragile. This is because almost all stones are very heavily included. These inclusions make weak spots in the crystal structure, and a sharp hit in the right spot can all but destroy a cut emerald. Another effect of the high incidences of inclusions is that cutting and polishing an emerald is much more difficult. Most polished emeralds will be in the classic emerald cut or in “fancy” shapes. Few would ever become round stones. Emeralds rarely appear alone in rings or other items. They can benefit greatly from the presence of diamonds which act as a halo or other supporting element. The contrast helps to bring out the color of the emerald and can make an inferior stone look to be of much higher quality. They are a favorite in earrings and necklaces, as their vivid color makes them very eye-catching. 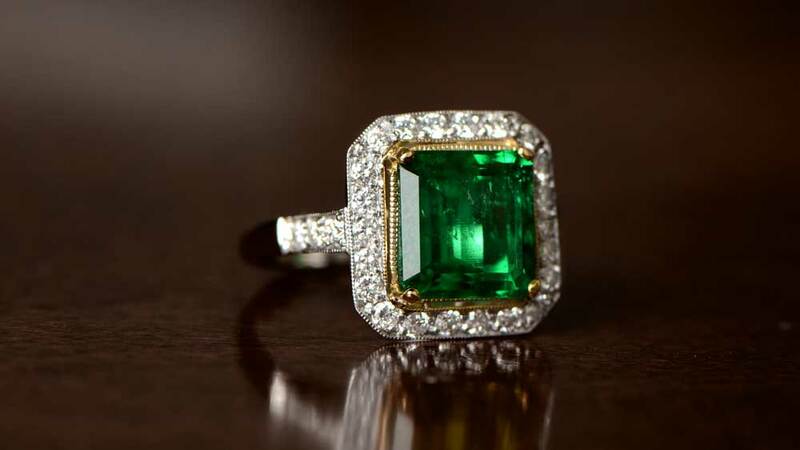 The value of emerald can vary wildly from the best stones to the worst, with the best fetching prices higher than even high-quality diamonds. As with all precious stones, the 4Cs of cut, color, clarity and carat weight will determine the value of an individual stone. However, there are no actual cut standards for emeralds, so it will be evaluated on symmetry and other single properties. Emerald is only about 2/3 the density of a sapphire, so you can often get a stone 30-40% bigger than the equivalent sapphire for a similar price. 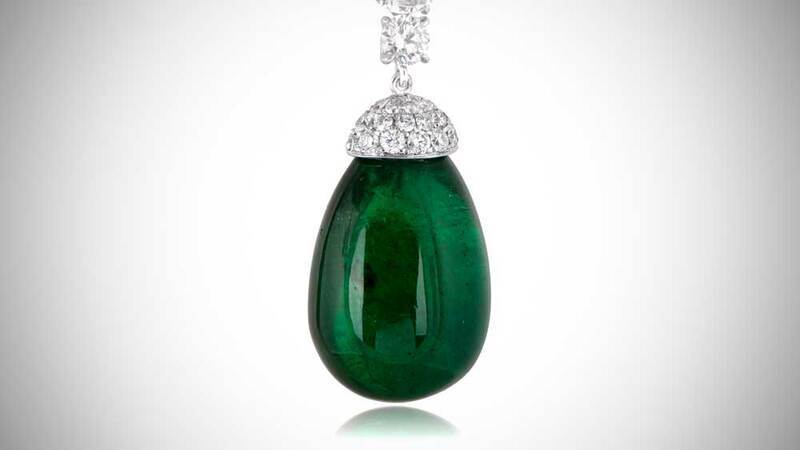 By far the biggest contributor to an emerald’s value, though, is the color. Despite this, there is no “best” color standard. Each region produces emerald of different hues, and it is the color purity and intensity which will determine the price. This might mean two stones of slightly different colors having the same value. Synthetic emeralds are readily available and first appeared in the 1960s. They differ from many synthetic gemstones, in that they are often chemically, physically and optically identical to natural emeralds. Such stones must be described as “created” or “synthetic” in the US, and are much cheaper than natural stones. Take care if buying overseas, as such regulations may not be in place. Because of an emerald’s relative fragility, they often appear in bezel settings to protect the edges. 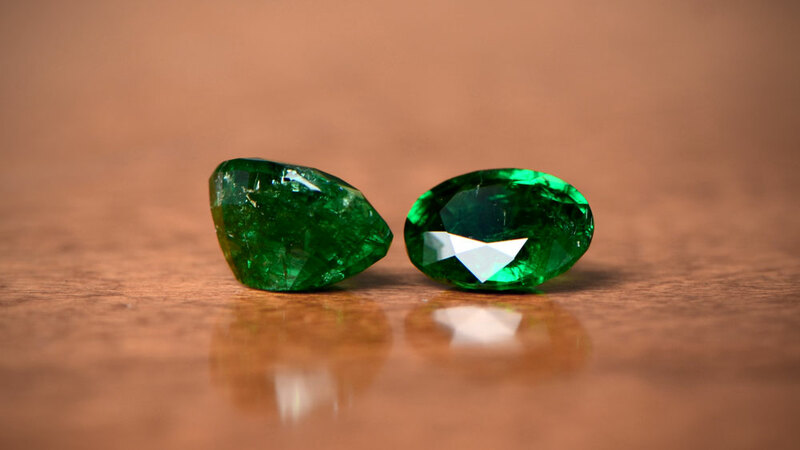 As most have had heat treatment or oil filling, emeralds should never be exposed to high temperatures. This includes steamers or even boiling water, as this will affect the integrity of the oil, and could end up fracturing the emerald. If you cannot put your hand in the water comfortably, then it is too hot for any emerald. Even if the emeralds are secondary stones in a ring, clean the entire ring with care. Ultrasonic cleaners can also prove fatal for your emerald. The high-frequency vibrations may cause the stone to shatter, and are at least likely to damage it in some way. Use warm water, some mild soap, and a very soft baby toothbrush. You can leave the emerald in the soap/water solution for up to 10 minutes if necessary, but no longer. Gently work the dirt loose with the brush, and rinse. Repeat this until the jewelry is clean. Pat dry with a lint-free cloth and allow to air dry naturally for 24 hours. Never subject your emerald to even gentle heat to speed up drying.